This is an 11" high bust of high fired bisque. Hand painted patina. Willie Nelson is a responsible individual who knows the value of human kindness and caring as expressed in his music, friendships and his Bio Willie Clean Air Diesel Fuel. 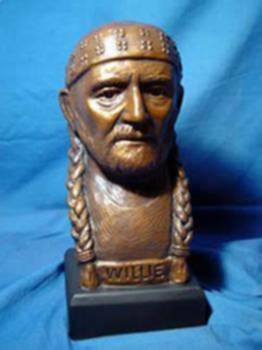 The Willie Nelson bust arrived today. I have one word for you, fantastic. The picture on your web site does not do it justice. I think you have captured his likeness completely. Thank you.